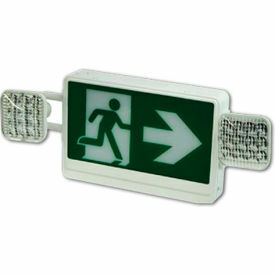 Combination Emergency LED Exit Signs and Lighting Provide Emergency Direction and Lighting For Power Outages in Schools, Offices, Commercial Property, and more. The thermoplastic housing is flame retardant, impact-resistant, and corrosion-proof for lasting reliability in the harshest conditions. Most models have dual LED lamps to provide high visibility during blackout conditions for pedestrian safety. The sealed, nickel-cadmium battery backup delivers 90 minutes of emergency power to lamps during extended power outages. 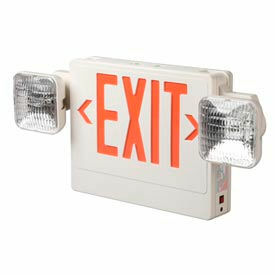 The two directional chevron knock-out inserts advise personnel of the nearest available emergency exits. UL listed for wet conditions. Dimensions vary per model.